Subnautica, to make use of someone else's reductivity, is basically underwater Minecraft, but even though it's still an Early Access game, Ian liked it quite a bit in his preview. 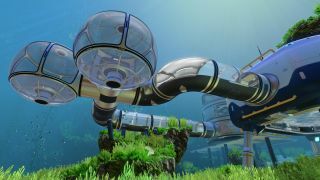 And he (and we) will probably like it even more now that the Habitat update is out, because now players can actually build a base on the bottom of the sea, complete with large rooms, panoramic observatories, and even a moon pool. Alas, that isn't quite as cool as I first thought it would be. As Wikipedia explains, moon pools are openings in the floors of marine vessels or underwater installations that provide access to the water in a calm and protected environment. In the case of Subnautica, the moon pool serves as a dry-dock for the Seamoth submersible—practical, but still something of a letdown. The moon pool, glass-bubble observatories, and generic "large compartments" can be strung together with standard and glass corridors as well as vertical connectors, giving completed bases a look that falls somewhere between BioShock and Habitrail. Compartments have eight attachment points for connecting corridors, dive hatches, windows, and other base modules, and can also be customized (a little bit) with wall-mounted lockers, signs, and even an aquarium. The update also brings with it a new Biome at the 200-450 meter depth, which includes unidentified flora, resources, and danger. Details on all of it, plus a cool little interactive demonstration of how habitat flooding works, are on the Subnautica Habitat Update page.